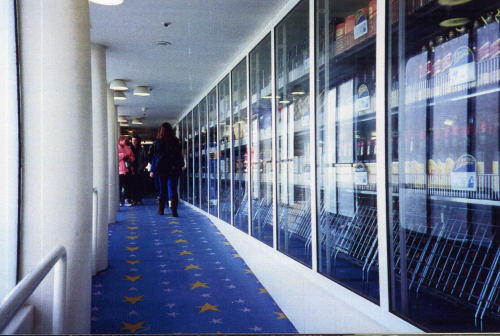 The area framed by the aft bar, the main lobby and the side passageways connecting the two was taken by the Shopping Centre, with the Children's Playroom tucked in just beyond on the starboard side. 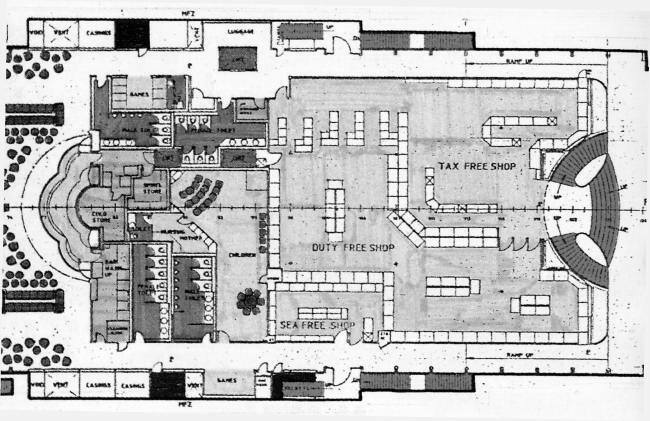 Originally comprised of three separate shops ('Tax Free', 'Duty Free' and a smaller 'Sea Kiosk'), the Fantasia and Fiesta's shopping areas were a vast improvement on the still partly-improvised superstructure extensions aboard direct British predecessors, St Anselm and St Christopher, which had entered service in 1980/81 with nothing more than a counter service shop. Things had moved forward dramatically in the subsequent decade and the shopping centre on the new ships was the largest on the Channel when they entered service. Fitted out throughout with the same distinctive Belgian-made blue carpet seen in the main lobby areas, the shopping centre gave a striking sense of spaciousness in comparison, albeit one somewhat undermined by the sheer volume of passengers passing through on an average crossing, a factor increased further by the central location and prominent signage as well as the inherent design concept of encouraging passengers to "explore the ship". 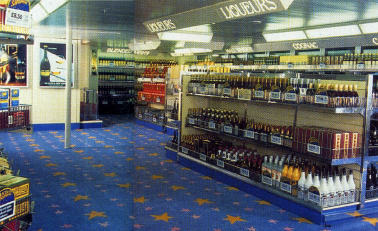 Above: On Fiesta, showing the forward port-side quarter of the Duty Free shop. 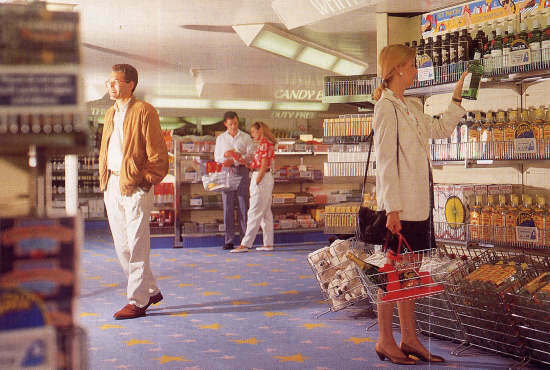 In the ships' original guises the shops were fairly conventional (if very large) with a regimented layout of supermarket-style shelving. In later years this would give way for a more open-plan style. 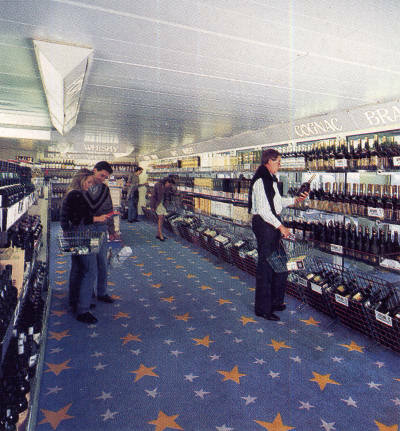 Below: Fantasia's Duty Free Shop in early 1990. This view is looking straight aft. 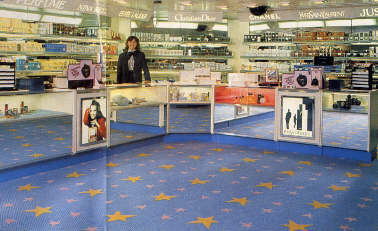 The Price tags on the shelving included a 'Fantasia Shopping' logo with stars and a blue background to match the carpet. Just visible in the background are the windows actually within the shop which overlooked the children's playroom. The saucer light fixtures which can be seen belong to the latter. Below: Two more pictures of the shopping areas on Fantasia as completed. On the left is another view of the Duty Free area, this time looking aft on the starboard side - just out of sight at the far end on the left is the entrance from the main staircase/lobby. On the right is a scene in a deserted Tax-Free shop. 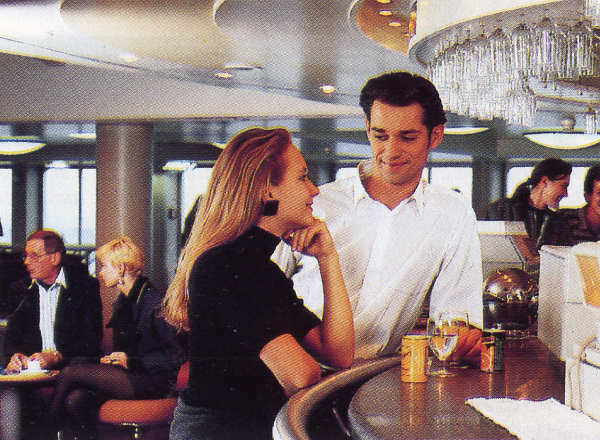 Here, Sealink preferred to stay with counter service for the sale of perfumes and other toiletries. Below: Proof that Sammy did indeed make it to the playroom eventually - a later view showing the seal, complete with beach ball, in his rightful position. 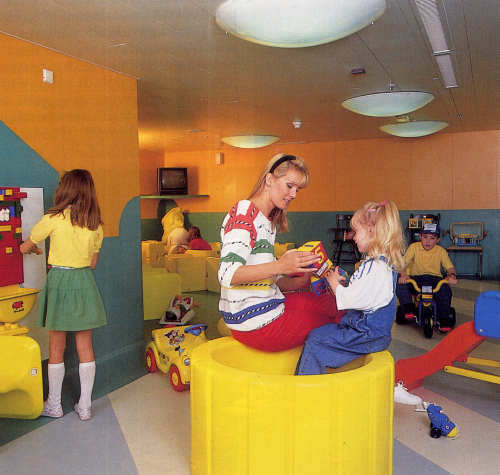 Above and Below: A Sealink scene showing the playroom as it was initially completed. Pre-delivery artist's impressions had shown the far (port-side) wall decorated by no less than four images of Sammy Sealink (below), mascot of the company's childrens' Commodore Club. However, the official photographers got to work prior to some details in the public rooms actually being finished. In this case, Sammy Sealink has yet to make an appearance. On the right hand side (forward), the room was overlooked by windows from within the adjacent Duty Free shop, enabling parents to keep an eye on their children whilst spending their money! Below: Deckplan extract showing the basic arrangement of the central part of the main deck, as it was when the ship entered service as Fantasia. 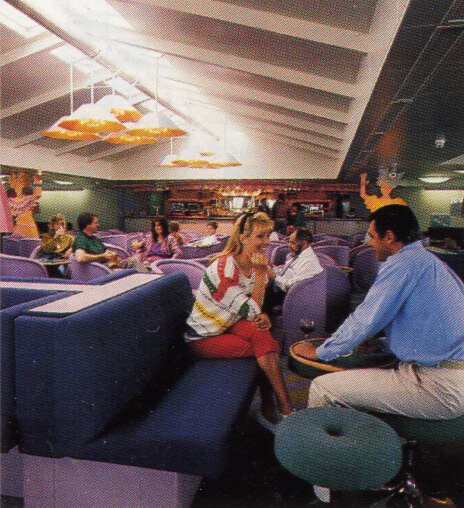 The aft bars on Fantasia and Fiesta were the point at which foot passengers boarding at Dover first entered the ships, thus forming their first impression of Sealink's "New Era" of ferry travel. 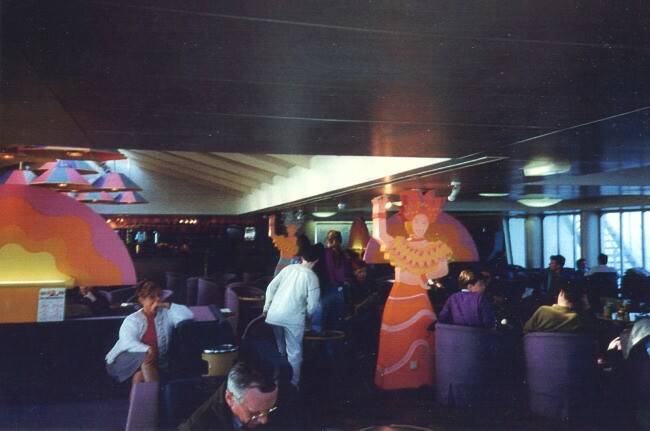 Although not quite as inspiring an entrance as that afforded Calais foot passengers (who in the early years boarded, as intended, straight into the main lobby) the Samba (Fantasia) and Carnival (Fiesta) Bars were equally dramatic in their own ways. 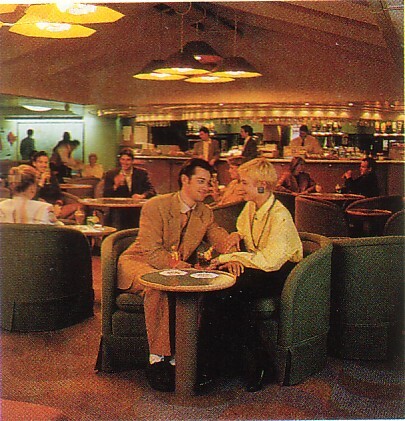 With full-size floor-to-ceiling windows to either side and astern plus, uniquely, a skylight in the deckhead above, the impression of light would have been a stark change to the dark smoking dens of previous generations of cross-channel ferries. This was allied to a light, pastel colour scheme with primarily purple and green seating in a combination of fixed sofas and many of the free-standing chairs of the standard design found also in the forward Motorists' Haven and in the small Lay-By Lounge on the deck above. Crowning it all were the decorative latin dancer forms draped around the ceiling supports, possibly the single most controversial element of the ship's decoration. The Naval Architect, reviewing Fantasia in May 1990, tut-tutted that they were perhaps "somewhat excessive" and these were possibly the source of other criticisms that the ships' decor was "over the top" and "vulgar". The Fiesta's Carnival Bar was rather more restrained, with the dancer forms not making an appearance. Above: The Samba Bar looking forward on Fantasia in her debut season showing the unique skylight above and latin dancer forms draped around the ceiling supports. Interior designer Warren Platner visualised "Latin Dancers in costume, standing on a carpet of green and lavender waves". 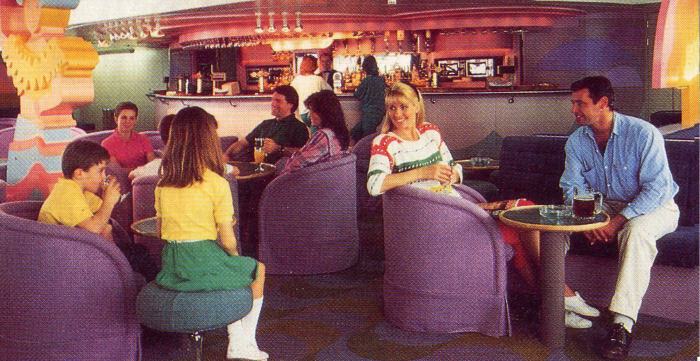 Above and below: Views highlighting the bar servery area on the Fantasia (above) and Fiesta (below). In both cases, the shape of the bar counter was reflected in pond-like "ripples" in the deckhead directly above.